"I have converted old home movies from VHS to digital files. However, they are saved in .ASF format. How do I convert them to MP4 that can play on my iPhone?" Are you in trouble of converting ASF files to MP4 format? In this article, we're here to introduce 2 easy ways helping you change the video format from ASF to MP4 without losing quality. • Smartly convert ASF to MP4 and other popular formats like AVI, MOV, FLV, 3GP, WebM and more with original quality. • Efficiently transfer ASF videos to iPhone, iPad, Android, Windows Mobile, Xbox, Sony PlayStation and smart TVs. Part 1: Why Do You Need to Convert ASF to MP4? Part 2: How Do You Convert ASF to MP4 (2 Ways)? Microsoft developed ASF (Advanced Systems Format) primarily for streaming and transmitting media over network. Like other video container format, ASF contains video, audio and some other data streams, like text, webpage, script commands and more. An ASF file commonly arrives with an extension .asf, .wma or .wmv which varies from the content encoded with Windows Media Audio and/or Windows Media video codecs. Why Do You Need to Convert ASF to MP4? Windows Media Player and some other 3-rd party players with pre-installed ASF codec (like VLC) can well support ASF playback. However, most portable devices give no support for ASF files. To convert ASF to MP4 is the best choice for movable enjoying your ASF movies/videos on iPhone, iPad, Android etc. In addition, MP4 is much widely acceptable by online video streaming services, SNS and video editing software. Therefore, you'd better transcode ASF to MP4 to implement video uploading and editing missions. How Can You Convert ASF to MP4? If you prefer to get a super stable process to convert ASF to MP4, video converter software for desktop must be your pick. WinX HD Video Converter Deluxee stands out boasting its powerful ability on video transcoding. Built in 370+ video/audio codec, WinX HD Video Converter Deluxe can flawlessly convert ASF to other formats (MP4, AVI, MOV, FLV, 3GP, WebM etc.) and vice versa. It will precisely calculate parameters to maintain original quality of the resulting MP4 file converted from ASF. Plus High Quality Engine, this ASF to MP4 converter can even optimize images and audios of output video. The support of hardware encoder (Intel QSV, Nvidia CUDA/NVENC), Hyper-threading tech and Multi-core CPU utility, it greatly accelerates conversion speed turning it to be No.1 fast video converter in the market. It is friendly to users at all levels from tech newbies to veterans with fairly accessible interface and operation. Of course, it is a totally clean and safe program without any annoying or malicious "extra". 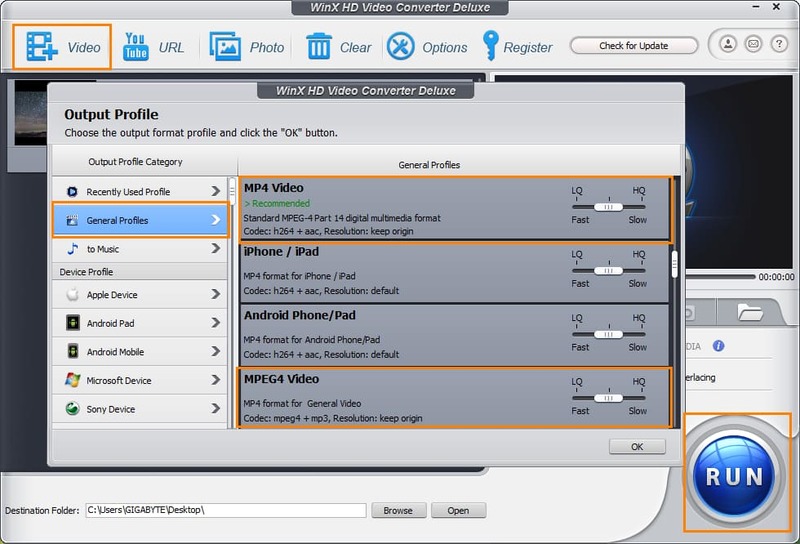 • WinX HD Video Converter Deluxe is designed with a concise and straightforward interface without any disturbing ads or buttons. • It embeds 370+ video/audio codecs making a reality to transcode 3GP to MP4, AVI, WMV, MOV, FLV etc, and vice versa. • With 410+ preset profiles for devices, it can convert 3GP to MP4 with precisely calculated parameters to absolutely meet video specs of iPhone, iPad, Android, Windows Mobile, Sony PlayStation, Xbox and smart TVs. • High Quality Engine helps optimize images/audios bringing lossless quality after converting 3GP to MP4. And, the utilization of Hardware encoders (Nvidia CUDA/NVENC) and hyper-threading tech greatly speed up conversion letting it become the fastest video converter in the market. After you have this ASF to MP4 converter installed on your computer, follow the steps to perform the transcoding process. Step 1. Launch WinX HD Video Converter Deluxe and click +Video button to load the target ASF file. Otherwise, drag and drop the file from hard drive to the converter window. Step 2. Output Profile window appears. Go to General Profiles category on the left side and then select MP4 Video (Codec: h264+aac) as output profile. Click OK. Step 3. Click Browse button to define a new destination folder to save output file. Now, click RUN button to start converting ASF to MP4. Soon, you will get a MP4 file and successfully play it on any players, devices and TVs. 1. Other categories like Device Profile, Web Video Profile, PC/Mac General Video, DVD Profile, HD Video and to Music are provided. You can freely choose any desired device or video/audio format as output. 2. If you want to batch convert videos, repeat step 1 and step 2 to add more files. If you want a more convenient way to convert 3GP to MP4 rather than installing an application on computer, online video converters can satisfy you. Zamzar is one the most popular free online tools with the full support of 3GP to MP4 transcoding. Zamzar announces supporting 1200+ different format embracing videos (ASF, MP4, AVI, 3GP, MOV, FLV etc. ), audios, eBooks and images. As a web application, it indeed delivers a quite easy and handy way to transcode files. Open the site and you can get a step 1/2/3/4 guide on home page. The support is available as well helping check the reason why you can't convert files. Step 1. Visit zamzar.com. Select Convert Files tab. Move to Step 1 panel and click Choose Files… button to add ASF file. Step 2. 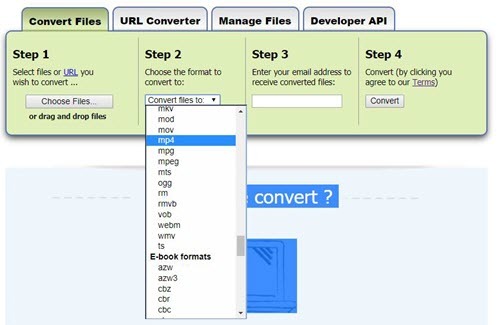 Move to Step 2 panel and click Convert files to: to select MP4 format from the dropdown list. Step 3. Move to Step 3 panel and enter a valid email address for receiving the resulting MP4 file. Step 4. Move to Step 4 panel and click Convert button. Step 4. Set a new destination for saving the output MP4 file if necessary. Now, click RUN button to start 3GP to MP4 conversion. 1. Zamzar only accepts the target file less than 50MB. Or, you should pay a plan (started at $9/month) to convert a larger ASF file to MP4. 2. The conversion speed is deeply affected by network condition. A bad network will waste you a lot of time to transcode a small video file. Certainly, you can't convert anything if there is no network. When converting a small ASF file to MP4 with a good network for once, online video converter is seemingly the most appropriate tool. But if you have dozens of HD videos which should be transcoded, video converter software can offer a more steady and speedy performance. Well, all depend on you. How to Convert AVI to MP4 for iPhone, iPod, Apple-TV, PSP etc.